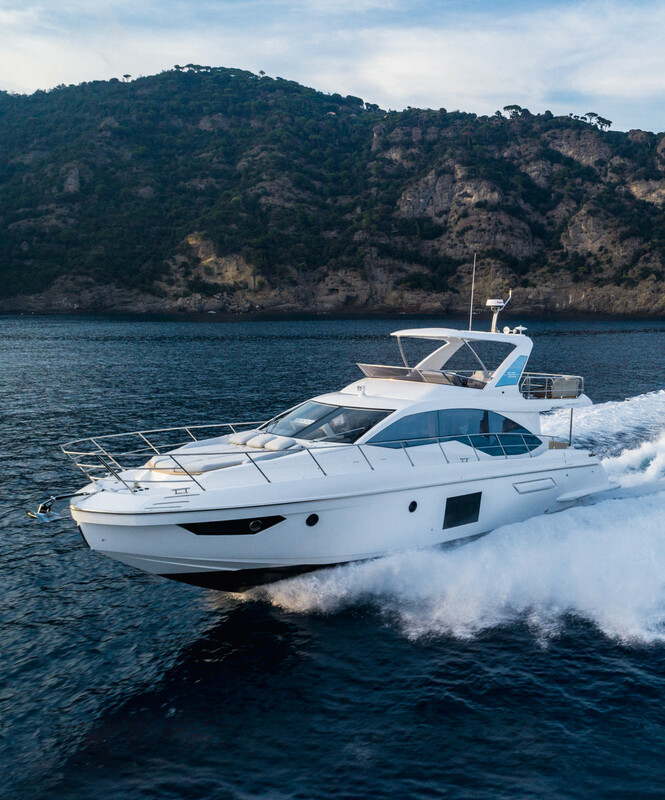 Dan Harding heads to the Ligurian Sea to sea-trial Azimut’s 55 Fly, where he discovers the secrets of its success. 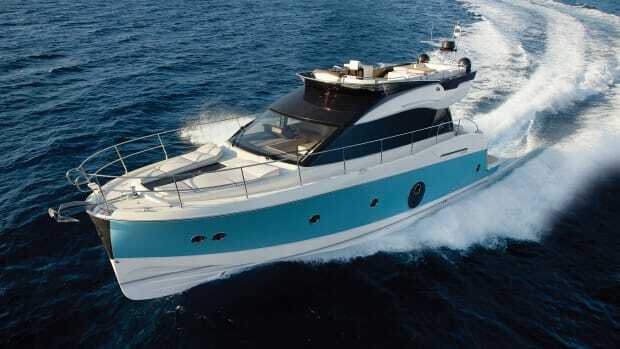 A whirlwind trip to Northern Italy and a sea trial of Azimut’s 55 Fly reveals the recipe to the brand’s secret sauce. Savona is a fairly industrial port in mountainous Northern Italy. Workboats, cranes and warehouses line the shore near the Ligurian Sea. Nestled in the crook of the inner harbor, however, is a microcosm of luxury: Azimut’s final fit out and launching location. 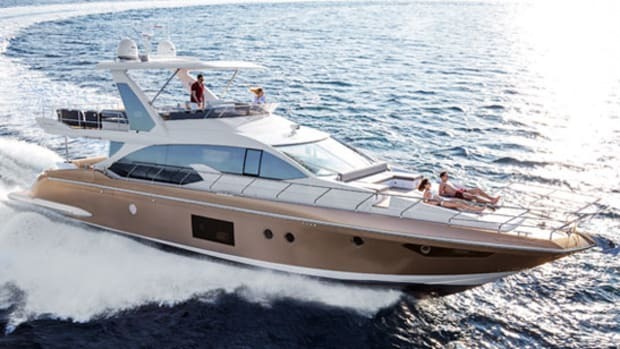 Dozens of new models, from coupes to flybridge motoryachts, gleam under the midday summer sun. I’ve been aboard countless Azimuts, but—like meeting a girlfriend’s parents for the first time—it’s always interesting to see where she comes from. I spy the new Azimut S6 resting under a shroud of plastic waiting to be painted and a 60 flybridge motoryacht under a test shed being sprayed with water and tested for leaks. Various new models are being prepped and polished, while countless more sit at a dock waiting to be shipped to owners. The thought of testing them all creeps into my mind. How long would that take? Could I expense an apartment for a month? How much weight would I gain while living in the land of linguini? 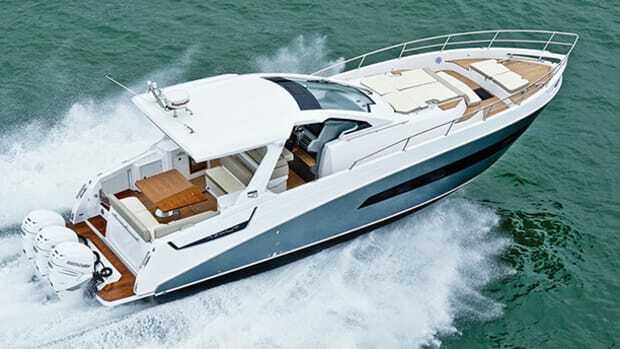 Eventually, my jetlagged brain snaps back to reality and the business at hand: testing the builder’s new 55 Fly. 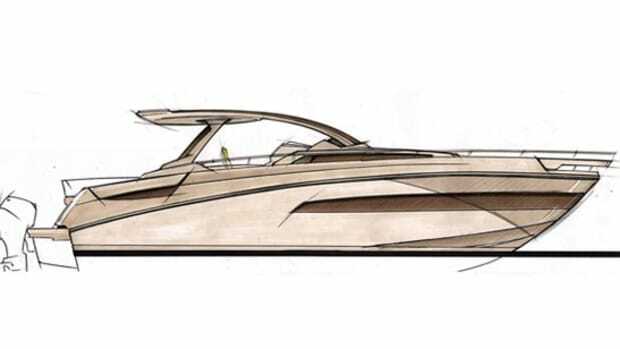 The 55 has a sporty exterior, courtesy of Stefano Righini. 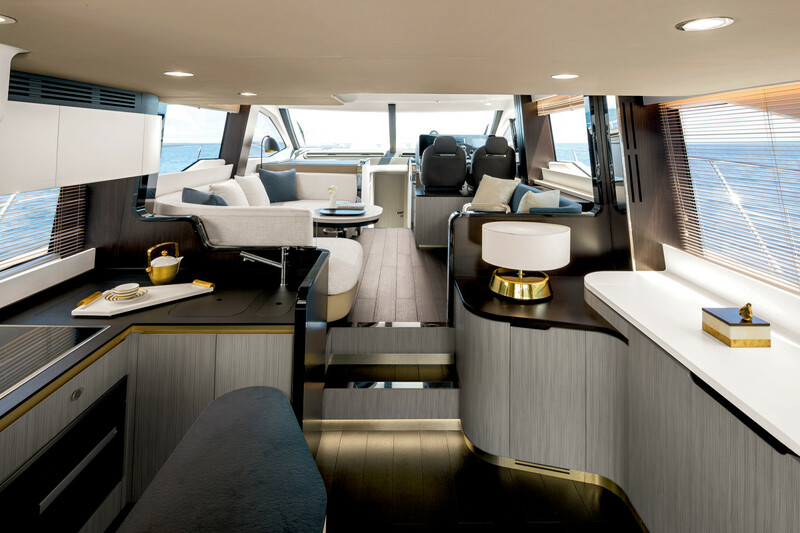 A raked windshield, plumb bow and sharp angled lines—from the hull chine to the flybridge hardtop—give the boat the type of high-performance look seen in the builder’s S Class. Step inside, however, and the 55 gives off a totally different vibe. Modern is how I would describe the interior, designed by Achille Salvagni. Stainless steel details are everywhere. And everywhere you look you see curved shapes. The salon seating, tables, counter corners—they’re all rounded, which lends the space the feeling of a luxurious Italian villa. The reason I really like this design has nothing to do with style and everything to do with safety; there are no edges or corners to bump into when underway. Safe and stylish, that’s a winning combination in my book. 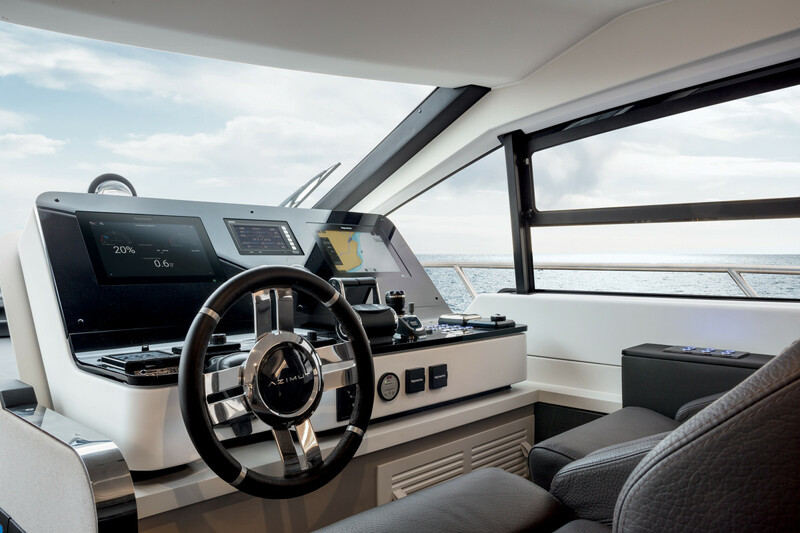 From the cockpit seating through the salon, it’s hard to find a sharp corner anywhere—making the boat stylish, but more importantly, safe. Belowdecks there is a conventional stateroom forward and a guest cabin to starboard. The amidships master is where things get interesting. 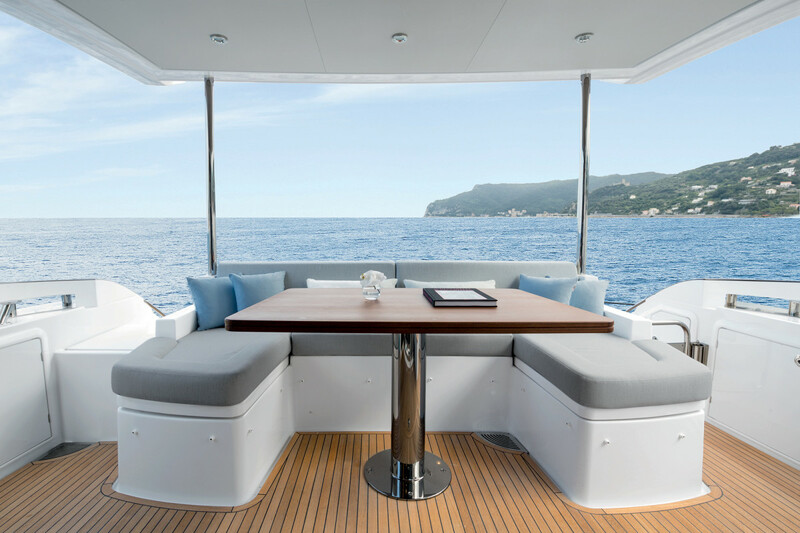 Azimut cantilevered the berth, which provides a more open floor plan and room for an exceptionally large four-drawer bureau to port. The windows in this stateroom are comparable to living room windows in some homes. They’re that big. 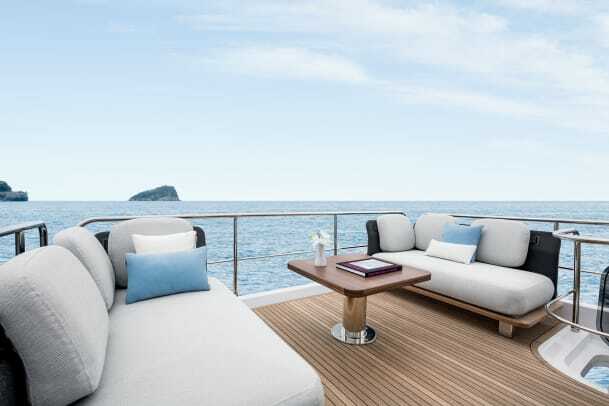 Floating furniture throughout the interior is a modern touch that is trickling down from the luxury home and superyacht world. The accommodations are rounded out by a captain’s quarters aft. In the U.S., I’d wager it will mostly be used for storage. I don’t think many Americans will need a captain for a boat this size but I am glad we have one aboard to take us out of the Med-moored-style slip in Savona. With inches to spare on either side and a couple feet of space between shiny new Azimuts and a metal shed, this docking challenge tests the captain’s skill and the precision of the joystick that’s paired to twin 800-hp MAN I6 diesels. Throughout the interior of the 55 Fly, world-renowned architect Achille Salvagni incorporated styling cues from the luxury home market. Aboard for the day is an eclectic assemblage. Joining me is Brand Manager Federico Lantero, Company Captain Nicola Gallo, my colleague Elena Patriarca and a trio of PR professionals who are facilitating the test. I’m no expert on the subject, but judging by how everyone seems to be relaxing and smiling more, I sense this group of busy business people is remembering why they got into the boating industry in the first place. 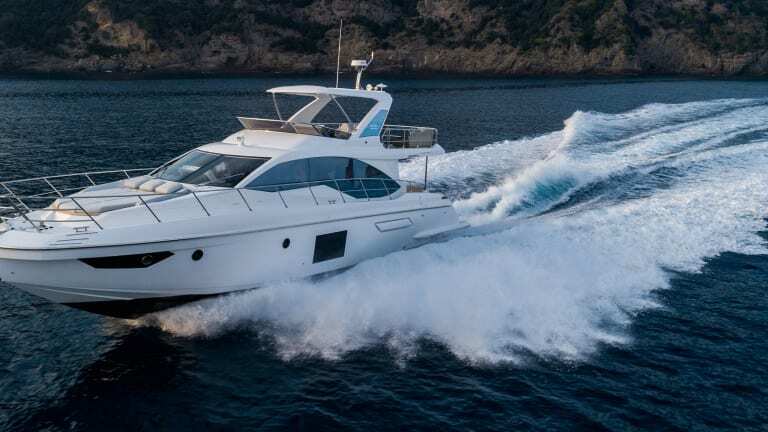 Away from the dock and the possibility of €5.5 million in damage (yes, I crunched the numbers) I take the lower helm in the Ligurian Sea and bring the boat up to a cruising speed of 22 knots. Visibility is exceptional and even though the water is calm—mirror calm almost—you can feel that this boat is solid and sturdy. I push the throttles forward and turn the wheel hard over to run us into our wake. What I hear is surprising: nothing. There’s not a single creak or moan from the boat or from our crew. Up here, I note two things from the helm. One is that the boat has very little heel in turns. 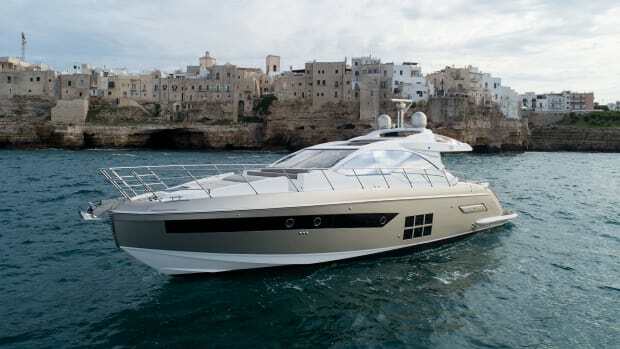 If sporty driving is your thing, you might want to consider the Azimut S Class. 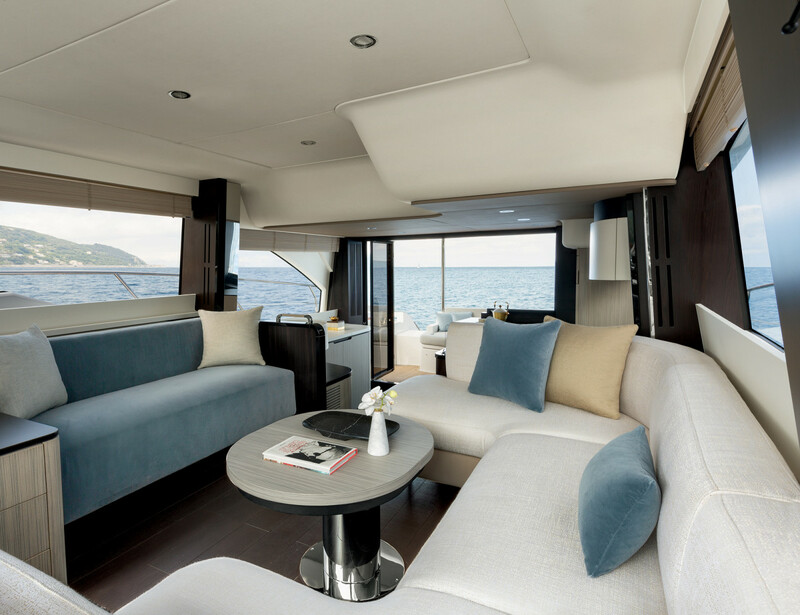 The driving experience aboard the 55 Fly is more focused on comfort. The second thing I observe is how much my companions seem to be enjoying their time on the water. My mind wanders from driving this boat in circles to putting a proper waypoint into the GPS and cruising to some exotic port. 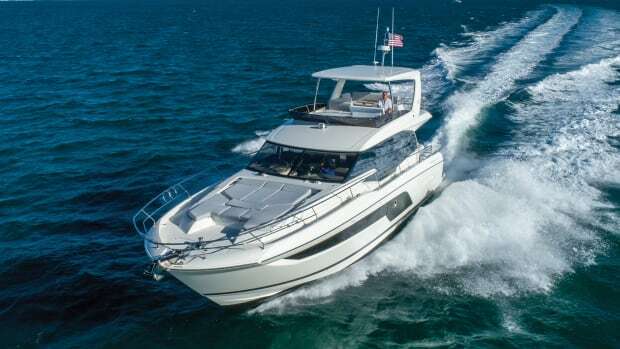 As many have come to expect, the helm is exceptionally clean and sightlines are excellent. Large windows allow a summer breeze to wander in. Alas, it isn’t meant to be. (Not this time anyway.) As we return to port, Gallo backs us into our space. We tie up without incident and I follow Lantero to the bow lounge. Like many European builders, Azimut is investing a lot of thought into making this area a comfortable social space. This model has a sunpad that can fit three adult guests. 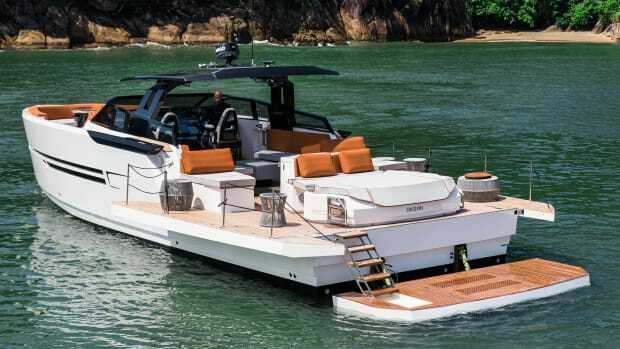 As more builders become conscious of the amount of time boaters are spending in the sun, they are placing more importance on areas like the large sunlounge that Lantero calls a “cocoon.” He invites me to give it a test. I tell him it’s a bad idea, having taken a red eye the night before. “I might just hibernate in this cocoon,” I tell him. I almost do. Calling it a sunpad really isn’t fair: It’s more like a sun memory-foam mattress. 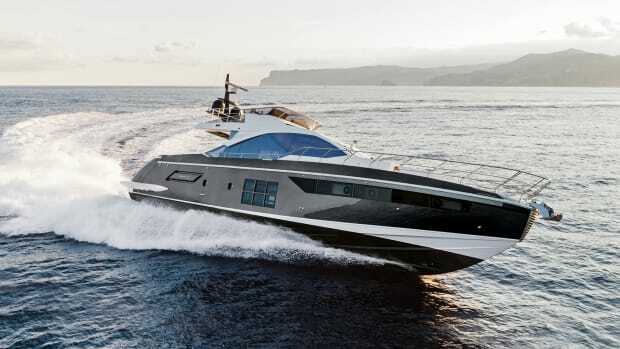 All too soon my time at the Azimut yard and aboard the 55 Fly comes to an end. For the next few hours I ride shotgun and compress my notes as Elena drives, weaving us through the darkening Italian countryside. I think back to the test. I liked the boat, but I can’t quite put my finger on why I enjoyed it so much. Elena and I eventually find a small cafe that’s open late for dinner. I order one of the best pizzas I’ve ever had. Fresh mozzarella, tomato sauce and buffalino is blended together perfectly. The 55 Fly, I realize, is kind of like this meal. There is no wild standout feature that is particularly new to boatbuilding. 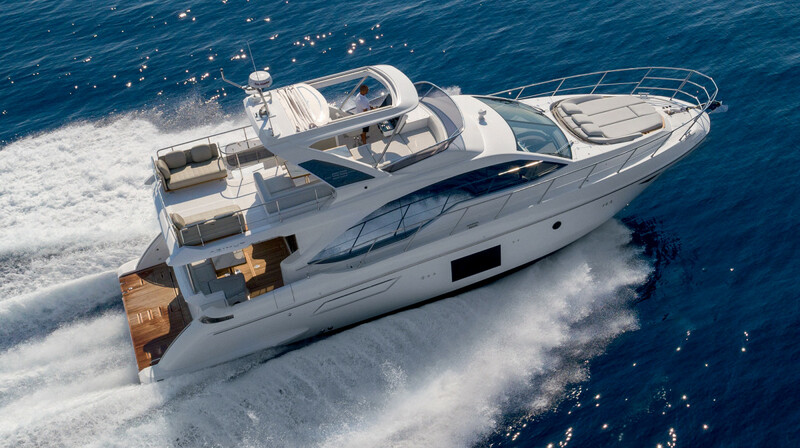 Instead, Azimut relies on fresh, proven ingredients and blends them together seamlessly. 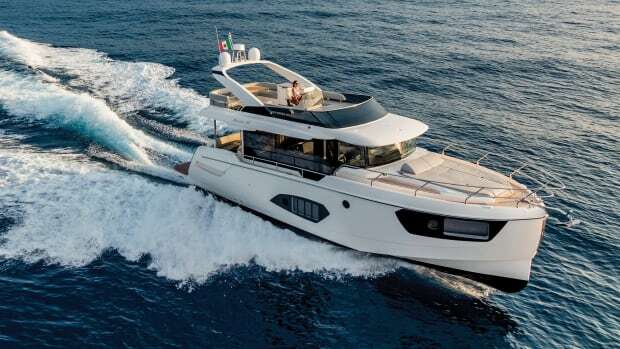 You have a proven base with the boat’s hull design and propulsion package, a smart layout at the heart of the model and all of it is topped off by sophisticated Italian styling. It’s something that is sometimes hard to put into words. It just works. Test Conditions: Temperature: 80°F; seas: flat. Load: Fuel: 300 gal., 7 people on board. Speeds are a two-way average recorded by a Raymarine multifunction display. GPH taken via MAN engine display. Sound levels measured at the helm. 65 dB(A) is the level of normal conversation. Range is based on 90 percent of advertised fuel capacity. 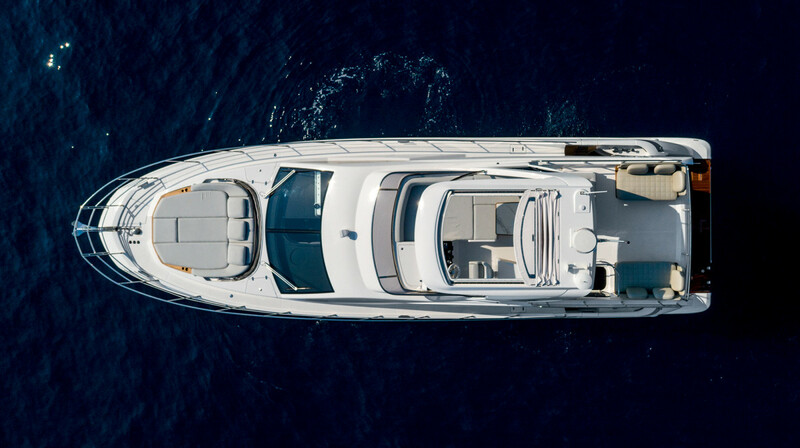 This article originally appeared in the October 2018 issue of Power & Motoryacht magazine.